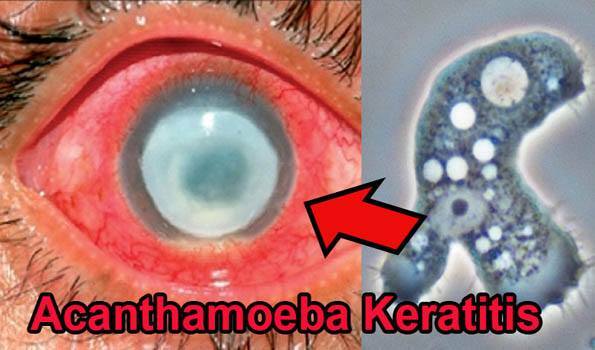 London :British eye researchers have found that a rare eye infection called Acanthamoeba Keratitis found in contact lens wearers, can cause blindness.The new study, led by UCL and Moorfields Eye Hospital researchers and involving 273 people, found a three-fold increase in Acanthamoeba Keratitis since 2011 in South-East England. Reusable contact lens wearers with the eye infection are more likely to have used an ineffective contact lens solution, have contaminated their lenses with water or reported poor contact lens hygiene, according to the findings published this week in the British Journal of Ophthalmology. "This infection is still quite rare, usually affecting 2.5 in 100,000 contact lens users per year in South East England, but it's largely preventable. This increase in cases highlights the need for contact lens users to be aware of the risks," said the study's lead author, Professor John Dart from UCL Institute of Ophthalmology and Moorfields Eye Hospital NHS Foundation Trust.Acanthamoeba keratitis is an eye disease that causes the front surface of the eye, the cornea, to become painful and inflamed, due to infection by Acanthamoeba, a cyst-forming microorganism. The study found that the risk of developing the disease was more than three times greater among those with poor contact lens hygiene, including those who did not always wash and dry their hands before handling their lenses and those who wore their contacts, while in swimming pools or hot tubs. Showering and face washing, while wearing contact lenses, were also likely to be risk factors, it added. "People who wear reusable contact lenses need to make sure they thoroughly wash and dry their hands before handling contact lenses, and avoid wearing them while swimming, face washing or bathing. Daily disposable lenses, which eliminate the need for contact lens cases or solutions, may be safer and we are currently analysing our data to establish the risk factors for these," Professor Dart told the Science Daily.